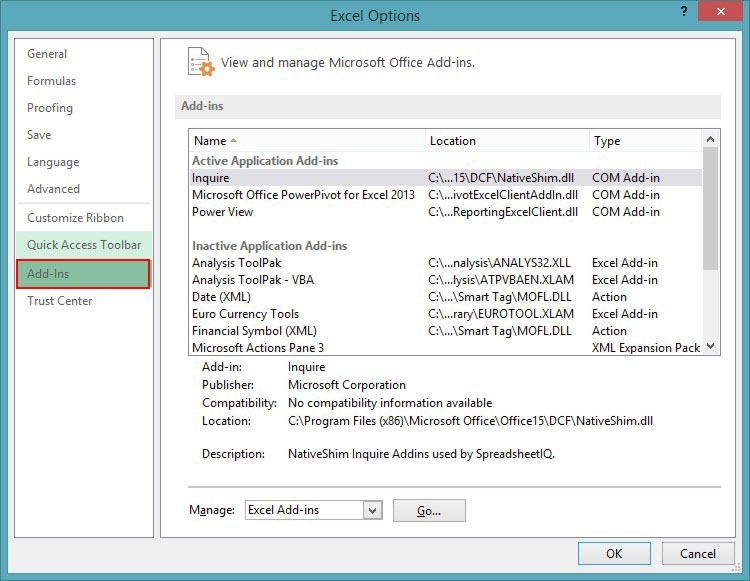 Once selected the Excel Options dialog box appears, where from the left of the window we select the category Add-Ins. Once selected in the middle of the window we can see all the Active Application Add-ins and all the Inactive Application Add-ins. Once we select an Add-in at the bottom of the window, we see a description of the Add-In as well with the name of the Publisher, the Compatibility, the Location and the Description of it. Excel Add-ins: a device or piece of software that can be added to a computer to give extra features or functions. Com Add-ins: COM Add-ins present the developer with a way to extend the functionality of Office applications for custom tasks. COM Add-ins are typically used to automate Excel in response to a click of a CommandBar button, a form or dialog box, or some other event specific to Excel such as opening or closing workbooks or entering data on worksheets. XML Expansion Packs: An XML expansion pack is the group of files that constitutes a smart document. You package one or more components that provide the logic needed for a smart document by using an XML expansion pack. Disabled Items: If we select this command the Disabled Items window will appear, where we can enable the disabled item that we want. All we have to do is to select the one that we want and then press the Go…, button that is located at the right. In the example below I have selected the COM Add-ins and then press the Go… button and straight away the Com Add-Ins window appears. In this window we can see the Add-Ins Available and which ones are activated and which ones are deactivated. The tick mark in the check boxes indicates which ones are activated. All we have to do is activate or deactivate the one that we want and then press the OK button at the right. If we want to add a Com Add-In we press the Add button at the right of the window, where we have to navigate where the Com Add-in is located on our computer. If we want to remove one we just select it and then press the Remove button from the right of the window. The same procedure is followed in all Microsoft Office programs. Below you can check out the video describing how to activate or deactivate Add-Ins in Microsoft Office 13. 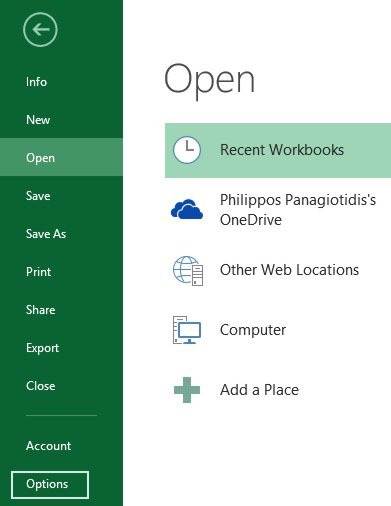 Posted on July 4, 2014, in Microsoft Office 2013 English, Office 2013 English and tagged Actions, Active Application Add-ins, Com Add-ins, Compatibility, Description, Disabled Items, Excel Add-ins, Excel Options, Inactive Application Add-ins, Location, Microsoft Office 13, MVP, Office Smart, Publisher, Smart Office, XML Expansion Packs. Bookmark the permalink. Comments Off on Enable Disable Add-Ins And Coms in Office 13.